Most people are pretty honest in building their social network at sites like LinkedIn and Plaxo, connection to people with whom they have a real relationship. It also helps that if you want to connect with someone out of the blue, you often have to enter the person's email address. Building your friendlist at microblogging site Twitter works differently though. On Twitter you send out your message to the world. Everytime you blurt something into the Twitterverse there's a good chance it gets picked up by someone you don't know. If they like your tweet, there's a good chance they'll start following you, and if you politely follow them back, you'll get into a new network, building your own. Networks on twitter can expand pretty fast to thousands of followers. Stars of Le Web 2.0 often have massive lists of followers, like Barack Obama (555,878), iJustine (285,034) Guy Kawasaki (100,318), Robert Scoble (74,688). It's impossible to pay attention to everything your 'friends' say when you've got such a list to monitor. Chances are that you're barely able to follow about a 100 or 150 of them actively. 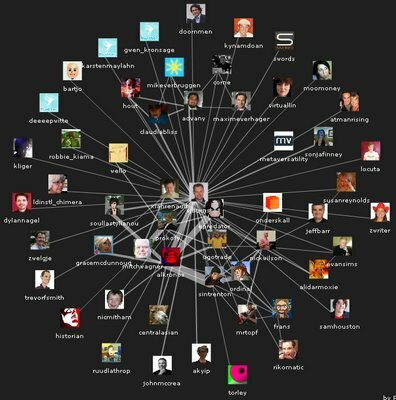 One of the nice tools that plug into Twitter is the Mailana social network analysis system, which taps into millions of messages, tweets and pulls up a nice graph of your Network. If your list of followers has grown too big to manage and you start to forget who your real friends are, maybe it's time to pull up a graph of your own to see who you've been interacting with. 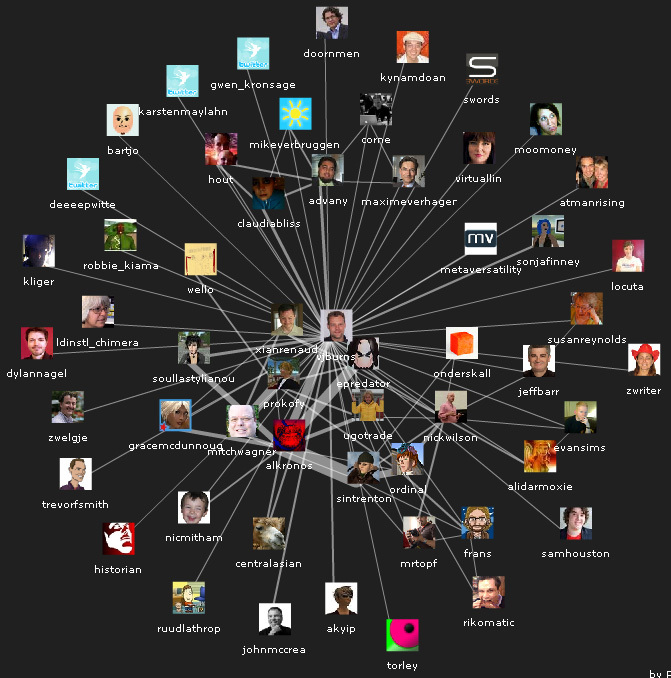 The image below is my Twittersphere, which you can explore here. Here it's mission accomplished. 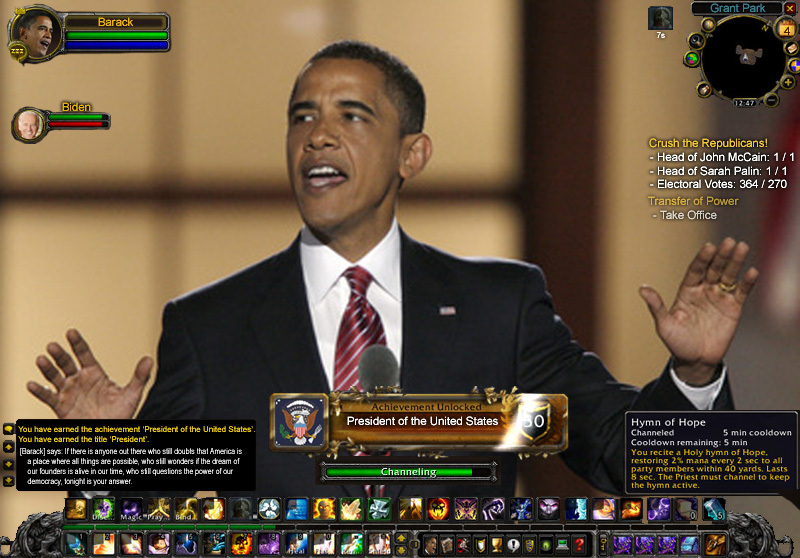 He is the first black president, but the mission is only starting. It's time for Change was the slogan used by Barack Obama in his election campaign. And indeed the winds of change are shaking the dust world wide in the wake of the Credit Crunch. Not the change desired by Obama, but change it is. 24/7 Wall Street reports that at least 12 major US newspapers are set for closure in the coming months. No one working in the media industry will ever have seen a year as bad as 2009 will be. The sharp slide in advertising began in 2008, and, based on the worsening economy, there is no reason to think that advertising will improve. Most Wall St. analysts have predicted a harsh year for the ad business. If the downturn deepens and unemployment rises above 10% most predictions about media, no matter how negative, will have been unexpectedly optimistic. The outlook might not be this grim here in the Netherlands, but newspapers are having a hard time over here too. Just yesterday I blogged on how Google should compensate it's CO2 emission and touched the subject of lack of innovation in the american automotive industry. I guess this pretty much is the same story. Traditional newspaper have stayed traditional. 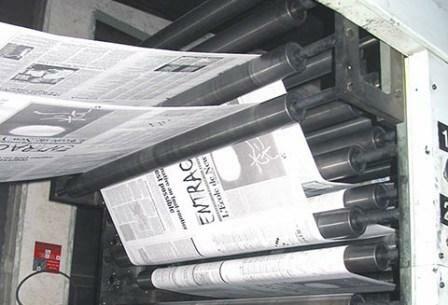 Most of the people working at newspapers are old timers, senior reporters and editors who have grown up with the traditional printing press and have switched to digital offset without really changing their process. Currently I see a lot of traditional publishers in the Netherlands clinging on to their outdated ways, trying to get a little bite of the mobile news market and a little bite of the online marketing chunk without wanting to change their own ways. This is lack of innovation. The credit crunch might be a blessing to shake that old tree (and save a rainforest in the proces) and force the old newspaper industry to innovate. The world of news and information has changed with the arrivel of web 2.0, called the social web, or conversational web by others. The most heard argument in this case is that bloggers are not trained journalists and are living the fastlane without time to do thorough research and taking time to write indepth stories. Well, there are a few out there that prove you wrong. And if that's the case, why not skip daily newspapers and let the bloggers and televesion do the daily news and create more indepth research magazines? On the website you'll find excerpts of the book in English. A complete English version will be published sometime februari / march. I'll keep you posted. The industry has grown with the first revolution and survived the second, but now is crumbling under the onslaught of this third media revolution. It was bound to happen sooner or later, the crunch is just the final push to speed up this third media revolution. It neither is Obama nor the Credit Crunch but a driving force called innovation that is bringing about these winds of change. A Credit Crunch and recession do funny things with people. All of a sudden we are all looking for a new job. Well, I personally am not, but professional networking sites like LinkedIn report an increase of 25% in activity and new connections made. On the other hand, Headhunters seem to turn down their activity a little. Over the past yerar I received at least two annoying calls a month, but it's been pretty quiet over the last two months. I guess it's pretty much a US thing to use LinkedIn for finding and hiring people, here in the Netherlands we kinda stick to old fashioned, not networked sites like Monsterboard or Nationale Vacaturebank. Anyway, if you're looking out for a new job, you might want to check out a new startup called Visual CV. It opened up for beta in early 2008 and offers a whole range of cool features to pimp your resume with video presentations and so on. "...VisualCV is a clever idea to update the traditional resume. It also allows applicants to stand out in the job market, and cuts out unnecessary steps (phone and in-person interviews) that make it more difficult for employers to see a body of work. Plus, it is entirely free..."
Read full article at Killer Startups. One of the example resumes that stands out of course is the one of Barack Obama, the president elect of the United States of America. 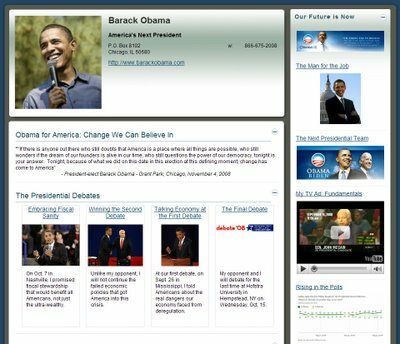 One slight comment, analysts say Barack is the first internet president, with all his neat web 2.0 ventures, like on Facebook, LinkedIn, Twitter and the Obama Blog. His resume is a little outdated though, it still states Presidential Candidate. However, a striking example of how leveraging the power of internet can help you get a new job. 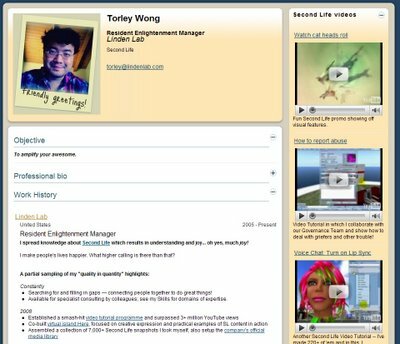 One example down the road, we find the Visual CV of Torley Wong, better known as Torley Linden or @torley, neatly wedged in between Barack Obama and former Apple evangelist Guy Kawasaki in the "Influencer" category at Visual CV. Not sure if this is on the same level, but one could say Torley is the people's president of Second Life, or officially Resident Enlightenment Manager at Linden Lab. Well, time to get out there and pimp that resume.It's easy to do, create then share. ...VisualCV offers a unique feature that lets you track who views your profile after you've shared it, but unlike resumes you post on other job sites, VisualCV's members have more control over their resume's privacy - there are no backdoors for recruiters or marketers to access your resume..."
Read full article at Read Write Web. Read full article at Wall Street Journal.